For the first time in five years, Danny Worsnop’s lead vocals are back on the latest Asking Alexandria album – and the wait has been worthwhile. Their self-titled album arrives a little over a year since their last release, The Black. Although an upheaval of sorts revolved around the time in between records, the evolution of the band is a triumphant one with this release. The opening track, “Alone in a Room”, is one of the most powerful tracks lyrically. The song touches upon Worsnop’s solo album, and his time away from the band. It’s not brushed under the rug, it’s not the elephant in the room; it’s an acknowledgement and almost an apology, according to guitarist Ben Bruce in an interview with Rock Sound. The acknowledgement of the elephant in the room is sprinkled throughout the record, from the first single “Into the Fire” – a song reminiscent to their earlier work with a more polished twist – to “Vultures” – a song written back in 2014 that was the last song Bruce and Worsnop wrote before his departure and the first song they recorded after his return. While it’s apparent that this is not the Asking Alexandria of five years ago, subtle nods to records past give their fans a piece of their former songs. “When The Lights Come On” references their album Stand Up while “Room 138” shares similarities with “If You Can’t Ride Two Horses At Once… You Should Get Out of the Circus”. The drastic change works for them, creating a worthy reintroduction to their original lineup. The audience can almost instantly hear the layers of passion within each track along with the clear joy of once again playing and performing together. It’s a more mature, more polished, more expansive set of songs than they’ve ever released. It’s about facing fears, hitting rock bottom and turning anger into peace. 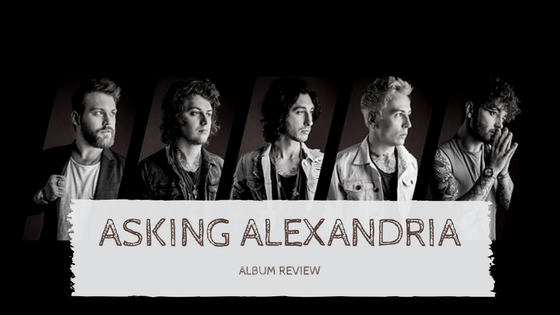 To read track-by-track analyses of Asking Alexandria’s self-titled, read Ben Bruce’s interview with Rock Sound and Danny Worsnop’s interview with Alternative Press.